I agree with these words. And I think many of the 2 million members of the American Legion in over 13,000 posts across the United States and in Mexico, France, Puerto Rico, and the Philippines, agree too. Many of you may have seen an American Legion booth at your local County Fair this summer. 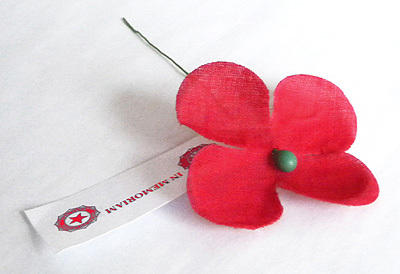 You may have even donated a couple bucks and received a small artificial red flower in return. That flower is a poppy. Poppies proliferated in Europe after the First World War because, as some scientists believe, of the lime from the remains of rubble that leached into soils in France and Belgium. The poppy was perceived as a symbol of blood, and was popularized by Lieutenant Colonel John McCrae, MD in the poem, In Flanders Fields. The American Legion named the poppy as its official flower in 1920, and began to distribute them for donations in 1924. On September 16th, 1919, the United States Congress chartered the American Legion. Its purpose is to uphold and defend our Constitution, promote peace and good will among people at home and abroad, preserve the memories and incidents hostilities fought to uphold democracy, to cement the ties and comradeship born of service, and consecrate the efforts of its members to mutual helpfulness and service to their country. Last Tuesday, the American Legion held its 100th National Convention. The American Legion has also been instrumental in influencing our history since its creation. One of its first acts was to fight for the creation of the US Veterans Bureau (today called the Veterans Administration) on August 9th, 1921. Next, the American Legion drafted its first Flag Code, in 1923. The code provided instructions on how to handle the American flag. This code was passed into law by Congress in 1942. The American Legion also remains a leader in the efforts to pass a constitutional amendment banning flag desecration. The American Legion has also strongly influenced our favorite pastime. In 1925, it created the American Legion Baseball program. According to the Legions website, legion.org, more than 50 percent of Major League Baseball players are graduates of the program. About 82,000 youths play on Legion-sponsored teams each year. The American Legion has taught young people about how government works and funded scholarships. It fought for the passage of the GI Bill and supported health organizations. It has worked to improve child welfare, and created a fund for national emergencies. It has been dedicated to a full account of any missing Prisoners of War (POW) and was the largest donor to the Vietnam War Memorial in Washington DC. It wrote the only national program to protect children on Halloween, and fought to publish the effects of Agent Orange. It supports families of military men and women who are deployed, and teaches firearm safety to young people. The American Legion makes us proud. I want to congratulate the organization on its 100th National Convention. The work you do is important. Thank you. It should come as no surprise that such a fine organization counted the late Senator John McCain as a member. The Senator passed away last weekend, succumbing to brain cancer. Senator McCain was a veteran, a decorated Naval aviator who served in the Vietnam War. He was shot down during Operation Thunder and captured by the Viet Cong in 1967. He was a prisoner of war, and he was tortured before his eventual release in 1973. His years in the Hanoi Hilton left him permanently disabled. Captain McCain retired from the Navy and was elected to the US House of Representatives in 1981. When former presidential candidate and Senate legend Barry Goldwater announced his retirement, Congressman McCain ran and won his seat in the United States Senate. He eventually went on to run for President in 2000 and again in 2008. I had the distinct honor of meeting and spending some time with Senator McCain a few years ago. I salute a true American hero, a fellow veteran. True, we did not always agree. Who does? In the end, I did agree with his final words to our country. We believe always in the promise and greatness of America because nothing is inevitable here. Americans never quit, we never surrender, we never hide from history. We make history. Godspeed, Captain McCain. Thank you for your service. For all the sacrifices that Veterans have made and will make for our country we are able to celebrate Labor Day this weekend. To all the workers of America and especially all of those in Northwest Illinois thank you for your hard work that has contributed to the strength, prosperity and well-being of our state and country!